Maybe you just want to enjoy food without any guilt? We are continually bombarded with new nutrition and health research, and there is a diet for everything. 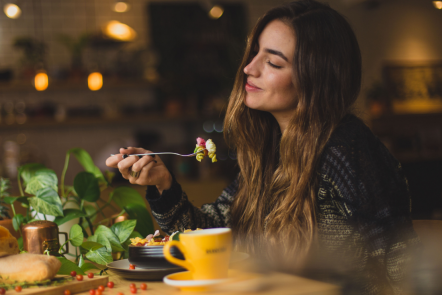 This course is similar to the Eating for You Introduction to Mindful Eating Workshop, except you have lifetime access to all of the sessions in the course. Please read the detailed information below, including the terms and conditions, before purchasing the course. This course is ideal if you are wanting to improve your eating habits and health—including digestion, body weight, and general wellbeing. The course is ideally completed in one time block or over two to three consecutive days. I recommend that you choose a quiet seated location with no or minimal distractions. You will require your own snack size serving of food for one activity in session 4. This online course is similar to the Introduction to Mindful Eating Workshop, but you receive lifetime access to the video sessions. There is also a downloadable document covering the most frequently asked questions about mindful eating. Refunds are not offered on this course. Thank you, Sallyanne, for your encouraging and inspiring course. I have maintained weight loss for a while but got a bit back into bad habits and a few kilograms have slowly slid back on. Going through the sessions on your online course has given me a nudge and a reminder about the benefits of eating more mindfully to my wellbeing. It is a powerful message that you share. The sessions flowed well and weren’t overwhelming in content or length, they were just right. The photos are beautiful, inspiring and complement the content. I loved the chocolate story, can so relate to that! I enjoyed the food observation and mindful eating activities too. They have helped me to slow down my pace of eating so I truly savour all of the flavours of my food. The course is inspiring and also a peaceful experience, rather like that lovely state you feel after a yoga class. Thanks Sallyanne, I really enjoyed the online course. I particularly liked the suggestion of rating your hunger. It really makes you understand what emotion is linked to your desire to eat. I found this a very interesting exercise. I’m quite a rigid eater so I also liked learning how to listen to what my body feels like eating.